Mouse anti Human HIV-1 114D3.08. 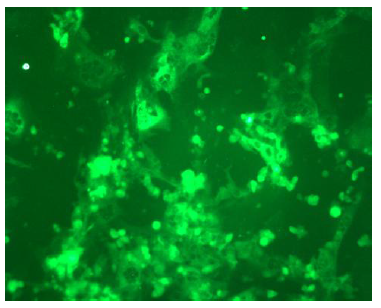 Product is tested for Immunocytochemistry/Immunofluorescence, Frozen Sections. 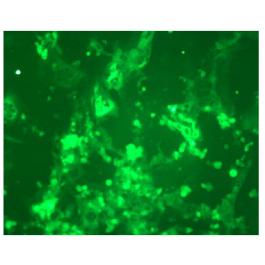 DDX1300P-50 / DDX1300P-100 Purified: ImmunoFluorescence, ImmunoHistoChemistry frozen sections. *This monoclonal antibody may be used between 5-25 μg/ml. *Optimal dilution should be determined by each laboratory for each application. *Coupled antibody: to maintain RT before using. HIV env gene encodes for a primary env product (gp160) which is cleaved into gp120 and gp41. gp120 is anchored to the viral membrane, via non-covalent bonds with the transmembrane glycoprotein, gp41. Mice were immunized with gp160 and gp120 recombinant proteins and the CHO-NL4.3 line expressing gp120 and the extracellular domain of gp41. -20°C. KEEP CONTENTS STERILE: no preservative. Purified antibodies: avoid repeated freeze/thaw cycles. Coupled antibodies: glycerol protects from freezing. Purified: 100 μg in 200μl / 50 μg in 100 μl Tris-NaCl pH 8. Coupled: 100 μg in 200μl / 50 μg in 100 μl Tris PBS 50% glycerol.